Stretch marks, referred to as striae in the medical field, are one of the most common skin problems affecting as many as 50% to 90% of all women. They are an unsightly form of scarring formed by too much stress being put on the dermis. The appearance of stretch marks varies with each person and skin tone. Many stretch marks start with a red hue due to the vascular nature of the scar, and gradually fade to white or silvery marks over time. Most medical research about stretch marks is aimed at the initial darker stages. Doctors report that stretch mark treatments are most effective during the first red or purple stages. Many women try to treat the white or silver lines and indentations with over-the-counter creams and lotions, often with little to no success. Men and women of all ages can suffer from stretch marks. Some people develop them very early in their lives, others develop them later. 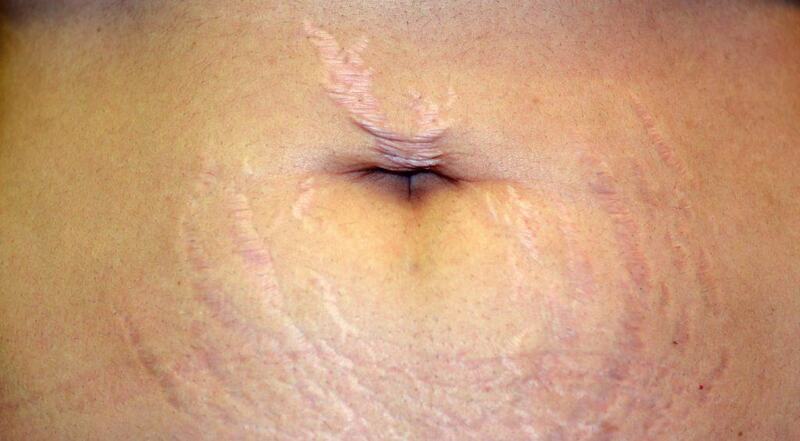 Caucasian women are more prone to stretch marks than those of Asian or African descent. 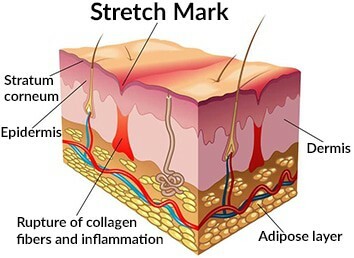 The stretching of the skin due to increased size of the body and an increase in cortisone is what causes stretch marks. Cortisone is a stress hormone created by the adrenal glands. Simply stated, the collagen layer in the dermis of the skin is not able to keep pace with the expansion of the body, resulting in damaged collagen that splits the skin (stretch marks are actually scars). The most common causes of stretch marks include pregnancy, weight gain, weight training, use of certain medications and certain diseases. Pregnancy: Most women (75%) experience stretch marks due to the rapid growth of their stomach and/or breasts during pregnancy. Hormonal changes during pregnancy can also play a role in additional stretch marks. Weight Gain: Stretch marks appear when people gain weight rapidly, or go through growth spurts during puberty causing teenage stretch marks. The skin literally does not have enough time to adjust and stretch during these periods of growth, thus causing stretch marks. Weight Training: Those who body build or experience rapid muscle growth may also notice stretch marks due the same reasons mentioned above. Medication Use: Pills, creams, lotions or other medications that contain cortisone or steroids can cause stretch marks. Diseases or Conditions: Cushings’s syndrome and adrenal gland diseases can cause stretch marks on the entire body. Ehlers-Danlos syndrome and Marfan syndrome are also known to cause stretch marks. To make the conditions that cause stretch marks even worse, Cortisol prompts the body to accumulate excess fat. This additional fat is often stored around the middle of the body, forcing the skin to stretch and eventually causing stretch marks. Your doctor can diagnose stretch marks in a routine examination of your skin. The doctor may gain more knowledge of your stretch marks and what may have caused the stretch marks by asking about your family medical history, medications or any other medical conditions you have. If necessary, your doctor may request blood, urine or other tests to further diagnose the origin of the stretch marks. Now that we have learned what causes stretch marks, it’s time to talk about how to prevent stretch marks. Even daily use of lotions or creams will not completely eliminate your chances of getting stretch marks. The surest way to reduce the chances of getting stretch marks is to stay at a healthy weight. Pregnant women should work with a doctor to help prevent stretch marks, as lots of weight is gained in a relative short period of time. Rapid weight gain will boost your chances of getting stretch marks. There are several things you can do to help prevent stretch marks, or at the very least, lessen the chances that future ones may appear. Stay hydrated! Drinking at least 8 oz. of water for every 10 lbs of body weight each day will promote elasticity in your skin, which will help guard against stretch marks. If you consume an excessive amount of caffeine you need to drink more than the recommended 8 oz. per 10 lbs of water per day as part of protecting against stretch marks. Do your best to gain weight slowly during pregnancy so that you skin isn’t overly stretched too fast. Doctors say a healthy weight gain ranges anywhere from 25-35 pounds, depending on your BMI. Gradually gaining weight will allow the skin to stretch with the body reducing your chances of stretch marks. Don’t scratch! Even if it itches, scratching the areas that are stretching and likely to form stretch marks can cause more damage to the skin. The problem areas should be gently massaged rather than scratched. Massaging the probable stretch mark areas will create blood circulation and increase lymph flow and prompt cell growth, which will allow the skin to stretch naturally. Use stretch mark creams daily. Using specialized creams or ointments every day can help reduce your chances of stretch marks. Make sure your body is moving! Having a regular exercise regimen will improve your overall health and lessen your chance of weight gain and stretch marks. Exercise promotes healthy stretch mark free skin. Now that you know what causes stretch marks and how to prevent stretch marks, what do you if you already have stretch marks? Can the stretch marks be treated? Are the stretch marks a sign of some other medical problem? While stretch marks do not look pretty, they are harmless and should fade over time. Stretch marks do not require medical treatment if they are not bothersome. Regardless of what caused the stretch marks, if they bother you, there are many stretch mark removal treatments available to help get rid of stretch marks. The most effective treatment for stretch marks by far is laser stretch mark removal. The scientific medical field generally dismisses the claims that stretch mark removal creams and lotions are effective. However, many women and men who suffer from stretch marks swear by the use of lotions as a remedy for stretch marks. The most common stretch mark creams contain Vitamin E, Vitamin A, Cocoa butter and Shea butter. Vitamin A derivatives such as Retin-A are well known by many. Vitamin A is a natural antioxidant that is crucial for healthy skin development. Stress steroids such as Cortisol can reduce the amount of Vitamin A in the skin; therefore, it is crucial to replenish Vitamin A using creams in order to prevent stretch marks. Vitamin E is also an essential antioxidant that protects the skin from damage such as stretch marks. Cocoa butter has become an increasingly popular remedy for stretch marks. The thick cream moisturizes the skin, which helps the body maintain a healthy hydrated epidermis which is helpful in avoiding stretch marks. Shea butter is also popular among the younger generation in promoting healthy skin and avoiding stretch marks. The cream helps protect against damaging ultraviolet rays and improves circulation and replenishes essential fats that the skin needs in order to protect against getting stretch marks. While the medical field does not fully promote the use of stretch mark creams and lotions as effective treatments for stretch marks, it does recognize the benefits of applying moisturizers and massaging. A daily routine of applying and massaging these creams can help promote blood circulation and lymph flow and ultimately improve the collagen creation in the skin which is essential in protecting against stretch marks. Stretch mark removal creams are unable to dramatically reduce the appearance of stretch marks as their effectiveness is limited to the outer layer of the skin. Stretch marks are rooted in the dermis, or middle layer of the skin, and can therefore only be remedied by treatments that penetrate into the deeper dermis. Creams for stretch marks are most effective at creating overall skin health and while they may not be very effective treatment for stretch marks, they will decrease your chances of getting them. By far the most effective treatment for stretch marks are laser treatments. Used by many dermatologists on both prominent and faded stretch marks, laser stretch mark removal is a holistic solution to reduce their appearance from the inside out. The laser treatment helps boost new collagen production, which is damaged when stretch marks form. When the skin makes new collagen, the stretch marks fill in, tighten, contract and are reduced in size and depth. In dark red or pink stretch marks physicians utilize vascular lasers to direct their focus on swollen or damaged blood vessels within the stretch marks. 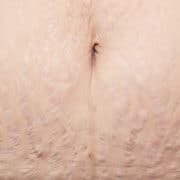 When the vasculature within the stretch marks is removed, the stretch marks fade and become much more difficult to see. Laser stretch mark removal treatments typically require multiple sessions. 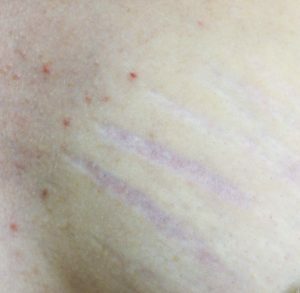 The stretch mark may contain an excess of vascularization that causes the stretch mark to become purple, red or pink. The stretch mark may be devoid of either a) or b) and may therefore be lighter than the surrounding skin. Depending on a, b, or c, a special serious of treatments will blend the color to match the surrounding skin. In as few as 3 to 5 treatments, the stretch marks will lighten and fade due to the fact that the scar tissue is actually being healed and eliminated rather than simply covered up.